In spite of stereotypes that paint people living with dementia as perpetually anxious and unhappy, recent research has found that the majority of years people live with cognitive impairment are happy ones. If a loved one has been diagnosed with Alzheimer’s disease or another form of dementia, these steps can help improve his or her quality of life. Create and stick to a routine. One cause of anxiety in people living with cognitive impairment is uncertainty. Developing a daily routine helps them know what to expect and lessens anxiety. That doesn’t mean you have to do the exact same things every day, rather that they should get up around the same time each day, have breakfast, then take part in an activity, whether that’s an exercise class for seniors, playing cards or doing puzzles, or going for a walk. It’s also helpful to time activities to coincide with their physical and psychological rhythms. For example, most people with dementia are cognitively sharper in the morning when they’re rested, so that’s a good time for activities that require concentration. 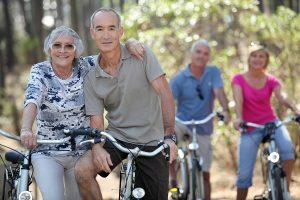 Encourage taking part in social activities that stimulate the brain. Music and art therapy can help improve mood and memory and, in some studies, reduce the need for pain medication for health conditions like back pain and arthritis. Social activities, such as volunteering, book or bridge club, and classes help people living with dementia both engage their brains and maintain social relationships that can decrease feelings of isolation and depression. A study found that just 60 minutes of conversation a week decreased levels of agitation and pain in people with dementia. Social activities also help people maintain their communication skills, an issue many people with dementia struggle with. Get regular exercise. Exercise has both physical and psychological benefits. Maintaining strength, balance, and coordination helps people maintain their independence longer and perform daily tasks more easily. It’s also a chance for social interaction and can improve self-esteem and confidence, lowering the risk of depression. Aerobic exercise improves cardiac health and increases blood flow to the brain, which helps promote brain health. Some good exercise options for older people include swimming, gardening, walking, tai chi, and dance. Take time to reminisce. Reminiscing therapy has become a popular strategy for people living with dementia. Some studies have found that remembering and discussing the past can not only improve mood, but also slow cognitive decline. Try looking through photo albums with your loved one and asking them questions about the people in the pictures or play music they enjoyed when they were younger and talk about what they remember from that era. Communicate with respect. Caring for someone who is living with cognitive impairment can be stressful and, at times, frustrating, but it’s important to communicate with your loved one with patience and respect. Don’t exclude them from conversations or talk about them with others as if they aren’t in the room. Give them more time to answer questions. Be aware of your facial expressions and body language as well as your words. Communication can also be non-verbal, such as a gentle touch on the hand or shoulder.